SAN FRANCISCO, U.S. – Founder/CEO Leslie Magsalay-Zeller expands Pooki’s Mahi Kafpresso line of single-origin Nespresso coffee pods with Peaberry coffee capsules; coffee subscribers can now conveniently brew espresso coffee with chocolate, and mocha flavors. The Silicon Valley luxury beverage company did not confirm the official launch date. “I want customers to make single-serve barista-quality espresso drinks with the push of a button from high-quality single-origin hard to find coffee beans. I wanted customers to quickly brew a single shot or a full cup with their favorite Kafpresso™ coffee capsules. Available in a range of coffee beans to suit every taste, a perfect single-serve coffee,” the Silicon Valley technology executive passionately explains. Kafpresso™ coffee capsules, delicious coffee by Pooki’s Mahi® designed by Founder/CEO Leslie Magsalay-Zeller through Komo Kitty℠ services. Pooki’s Mahi® luxury coffee pods and espresso capsules are compatible with Nespresso OriginalLine espresso machines, 100% recyclable, have a smooth, natural coffee-house flavor and made by coffee beans sourced directly from the farmers. The initial catalog of specialty coffee is available in a limited release due to coffee bean availability (micro lots). Founder/CEO Leslie Magsalay-Zeller actively audits Pooki’s Mahi supply chain including materials management. Pooki’s Mahi sources 100% Kona coffee through direct trade relationships. Pooki’s Mahi collaborates with coffee traders that have direct relationships with coffee growers to select single-origin coffee globally. Pooki’s Mahi chooses the highest coffee bean grade for the Kafpresso™ product line. Founder/CEO Leslie Magsalay-Zeller and Pooki’s Mahi supply base team thoroughly vets coffee growers. The criteria include but are not limited to striving to produce superior coffee, sustainable farming techniques, and providing fair and healthy conditions for their workers. 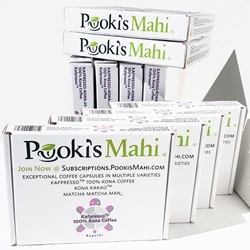 Pooki’s Mahi pays market rate to encourage and support approved coffee growers. Pooki’s Mahi supply base team samples coffee beans at multiple roasting locations. Once a coffee bean passes inspections, then coffees are tested against various roasters before adding it to the inventory. Pooki’s Mahi Kafpresso Peaberry coffee capsules use 100% Arabica coffee beans. Pooki’s Mahi supply base team purchases specialty coffee through direct trade relationships from coffee farmers using sustainable growing practices. Kafpresso™ Peaberry coffee capsules have strong cacao, chocolate or mocha taste. Between one to nine percent of any coffee crop will yield Peaberry coffee beans. Single-origin Peaberry coffee beans are separated from regularly sized coffee beans and sold for a premium price to their superior flavors. Kafpresso™ Peaberry currently sold as a Limited Edition; very few units are available. One Kafpresso™ Peaberry coffee capsule makes one cup of espresso coffee. Recyclable Kafpresso™ Peaberry coffee capsules made from single-origin specialty coffee bought through direct trade relationships. Kafpresso™ Peaberry coffee capsules for use in Nespresso OriginalLine single serve coffee maker. Nutrition information, California Prop 65 and tea capsule information visible on each package. Product samples are not available. Kafpresso Peaberry coffee capsules are available as a one-time purchase, one-month, quarterly or six-month subscription. Limited availability to VIP reseller distributors, and wholesale coffee club members.